Sulfuric acid is a strong mineral acid with the chemical formula H2SO4. It is soluble in water at all concentrations. Sulfuric acid is used in various applications. It is a key mineral acid employed in the chemical industry. Sulfuric acid, a highly reactive acid, is completely miscible in water. It is one of the extensively produced and consumed commercial chemicals globally. Sulfuric acid is the largest volume commodity chemical produced in the world. It is an odorless, colorless liquid, which is extensively utilized in the phosphate fertilizer industry. It is corrosive and has reactive properties. Sulfuric acid is primarily manufactured directly from elemental sulfur, which yields high purity sulfuric acid with almost no contaminants, in different grades and strengths such as 93%, 96%, and 98%. Sulfuric acid is produced using two processes: contact and lead chamber. The contact process uses a vanadium pentoxide (V2O5) catalyst to produce a highly concentrated H2SO4. The contact process uses raw materials such as elemental sulfur and hydrogen sulfide in the presence of a suitable catalyst, primarily vanadium pentoxide. Sulfuric acid can also be recovered from spent acid generated in various chemical process industries. In the lead chamber process, sulfur dioxide is introduced with steam and nitrogen dioxide into large chambers lined with sheet lead where the gases are sprayed down with water and chamber acid having a concentration of 62% – 70%. Sulfur dioxide and nitrogen dioxide are dissolved, during which the sulfur dioxide is oxidized to sulfuric acid. The presence of nitrogen dioxide is necessary for the reaction to proceed at a reasonable reaction rate. 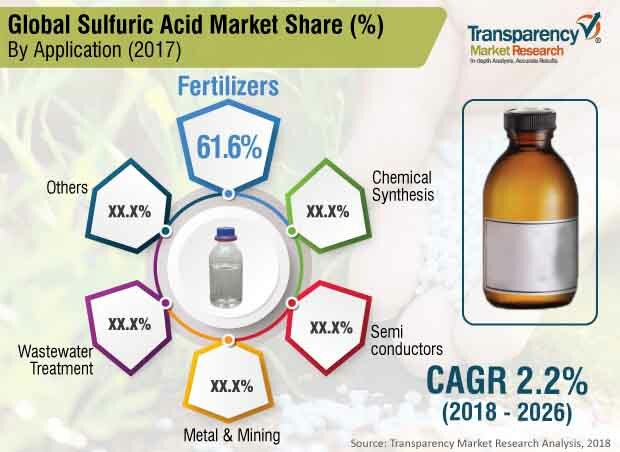 In terms of application, the sulfuric acid market has been segmented into fertilizers, chemical synthesis, wastewater treatment, metal & mining, semiconductors, and others. The others segment includes pharmaceuticals, batteries, and paper & pulp. The fertilizer segment is dominates the global sulfuric acid market. Sulfuric acid is primarily utilized in the production of phosphoric acid, which is used to manufacture fertilizers such as triple superphosphate and mono and diammonium phosphates. Fertilizers, especially phosphate fertilizers produced from wet-process phosphoric acid, is a major end-use industry of the sulfuric acid market. In terms of consumption, the fertilizer segment held more than 60% share of the global sulfuric acid market in 2017. Fertilizers such as superphosphates, ammonium phosphates, and ammonium sulfates are manufactured using sulfuric acid. Furthermore, sulfuric acid is extensively consumed in the synthesis of other bulk and specialty chemicals such as nitric acid, hydrofluoric acid, dyes, pigments, and titanium dioxide. Therefore, demand for sulfuric acid from the chemical synthesis segment is projected to rise at a considerable pace during the forecast period. Sulfuric acid is used in processing metals such as in pickling (cleaning) iron and steel before plating them with tin or zinc. Sulfuric acid is used to manufacture rayon. Sulfuric acid serves as an electrolyte in lead-acid storage batteries, which are employed in motor vehicles. Sulfuric acid is used in the pulp and paper industry, often for use in chlorine dioxide generation. Sulfuric acid is used in many other chemical processes and various wastewater and pH control applications. Demand for sulfuric acid is estimated to increase significantly in the near future due to the rise in the usage of the acid in fertilizers and other specialty and bulk chemicals such as nitric acid, hydrofluoric acid, and titanium dioxide. Demand for fertilizers, especially phosphate fertilizers, is anticipated to increase significantly due to the rise in production of cereals and oilseeds such as wheat, rice, cotton, and soya bean due to the growth in global population. Government subsidies for fertilizers and agricultural development in developing countries such as China, India, and South Africa is estimated to boost the phosphate fertilizers industry. Rise in global consumption of phosphate fertilizers is projected to propel the demand for sulfuric acid during the forecast period. However, volatility in prices of raw materials and crude oil during the forecast period is likely to hamper the sulfuric acid market. Recovery methods employed for regeneration of sulfuric acid and elemental sulfur are projected to create lucrative opportunities in the market during the forecast period. Usage of recovered products is expected to reduce the overall dependency on raw materials such as crude oil. This, in turn, is anticipated to boost the sulfuric acid market in the near future. Key players operating in the global sulfuric acid market are focusing on capacity expansion and mergers. This, in turn, is likely to propel the market during the forecast period. Key manufacturers operating in the sulfuric acid market include The Mosaic Company, Chemtrade Logistics Inc., Khaitan Chemicals & Fertilizers Limited, BASF SE, Nouryon, Southern States Chemical, and Honeywell International Inc.
Sulfuric acid is an extremely corrosive acid that is highly soluble in water. It is one of the most widely produced and consumed bulk chemicals worldwide. Sulfuric acid is employed in a wide range of industrial and domestic applications. It is extensively employed in fertilizers, wastewater treatment, chemical synthesis, metal & mining, paper, and pharmaceutical applications. Based on application, the global sulfuric acid market has been segmented into fertilizers, chemical synthesis, wastewater treatment, metal & mining, semiconductors, and others (including pulp & paper, pharmaceuticals, and batteries). In terms of volume, the fertilizers segment accounted for more than 60% share of the global sulfuric acid market in 2017. However, the chemical synthesis segment is projected to expand at a rapid pace by 2026. Demand for sulfuric acid from this segment is estimated to increase by 2026 owing to extensive use of the acid for synthesizing other industrial chemicals. Sulfuric acid is used to manufacture dyes, pigments, commodity chemicals, titanium dioxide, and pharmaceuticals. Hence, extensive use of sulfuric acid and rapid industrialization are estimated to drive the global market during the forecast period. Significant growth of the global fertilizers industry is another key factor propelling the demand for sulfuric acid. Sulfuric acid is a major raw material employed in the processing of phosphate fertilizers such as calcium dihydrogenphosphate, diammonium phosphate, and triple superphosphate. Raw materials rich in sulfur content are used to manufacture phosphate fertilizers; therefore, sulfuric acid is preferred in this application. Hence, rise in utilization of fertilizers for agricultural activities in regions such as Latin America, Asia Pacific, and North America is expected to boost the consumption of sulfuric acid by 2026. In terms of demand, Asia Pacific dominated the global sulfuric acid market in 2017. The market in the region is likely to expand at a rapid pace during the forecast period. Sure in utilization of sulfuric acid to produce fertilizers and in the processing of other industrial chemicals, and increase in government initiatives and collaborations with global manufacturing firms are major factors driving market in the region. Demand for sulfuric acid is low in Europe and North America due to implementation of stringent government regulations in these regions. Rise in mining activities for copper ores is a key driver of the sulfuric acid market in Latin America. Recovery of sulfur from oil & gas refineries in Middle East & Africa is projected to boost the market in the region. The report analyzes and forecasts the sulfuric acid market at the global and regional levels. The market has been projected in terms of volume (Kilo Tons) and value (US$ Mn) for the period from 2018 to 2026. The study includes drivers and restraints of the global sulfuric acid market. It also encompasses the anticipated impact of these drivers and restraints on the demand for sulfuric acid during the forecast period. The report highlights opportunities in the market at global and regional levels. The report comprises detailed value chain analysis, which provides a comprehensive view of the global sulfuric acid market. The Porter’s five forces model for the sulfuric acid market has also been included to help understand the competition landscape of the market. The study encompasses market attractiveness analysis, wherein application segments have been benchmarked based on their market size, growth rate, and general attractiveness. The study provides a decisive view of the global sulfuric acid market by segmenting it in terms of application and region. These segments have been analyzed based on the present and future trends. Regional segmentation includes the current and forecast demand for sulfuric acid in North America, Europe, Asia Pacific, Latin America, and Middle East & Africa. The report also covers individual application segments of the market in every region. The study includes profiles of major companies operating in the global sulfuric acid market. Key players profiled in the report on the global sulfuric acid market include The Mosaic Company, Chemtrade Logistics Inc., Khaitan Chemicals & Fertilizers Limited, BASF SE, Nouryon, Southern States Chemical, PQ Corporation, Ma’aden, INEOS, and PVS Chemicals. Market leaders engage in strategic pricing and product improvement to increase their profit margins. The report provides size (in terms of volume and value) of the global sulfuric acid market for the base year 2017 and the forecast between 2018 and 2026. Market numbers have been estimated based on application and regional segments. Market size and forecast for each product and application segment have been provided for the global and regional markets.